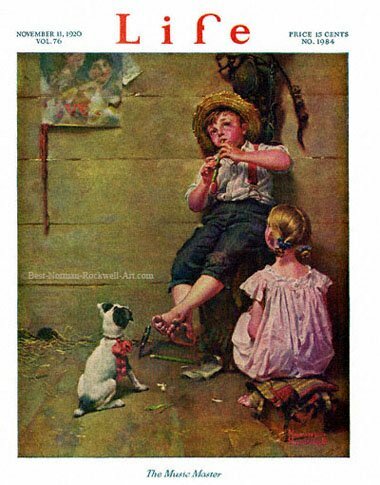 The Music Master, this Norman Rockwell painting, appeared on the cover of Life Magazine published November 11, 1920. The alternate title for this illustration is Boy Playing Whittled Flute. This was the twenty-first cover by Rockwell to appear on Life Magazine. A Rockwell painting appeared six times on Life magazine's cover in 1920 and twenty-eight times in all. With this painting, Norman Rockwell reverts back to his earlier subject matter. He treats us to a boy, a girl and a dog. The boy has whittled a flute from a reed. Obviously he has done this before and sounds pretty good, or the painting would be called Off-key Flute Player. Not only did he make the flute, but he also stuck his knife straight up in the wood floor. He must sound pretty good, because the dog and the girl are both still listening to his music. Of course, dogs and girls can both be pretty flattering to boys. Notice that the mouse hole in the wall seems empty. He must not be playing well enough to tame wild beasts.